Happy St. Patrick’s Day from Cool McCool’s Garage, where we don’t just wear green, we DRIVE it! And, the car stays clean! Chip Foose is my hero. 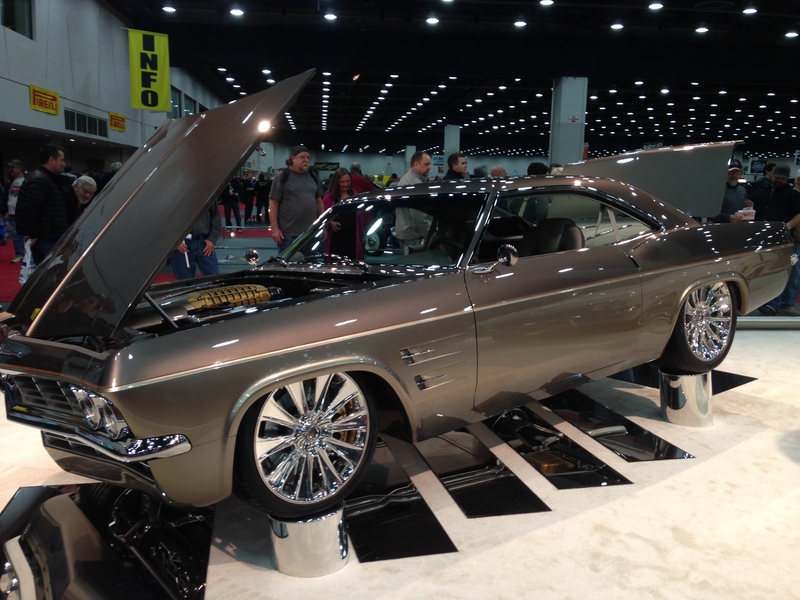 I’ll say it right now, Chip Foose is a hero of mine. 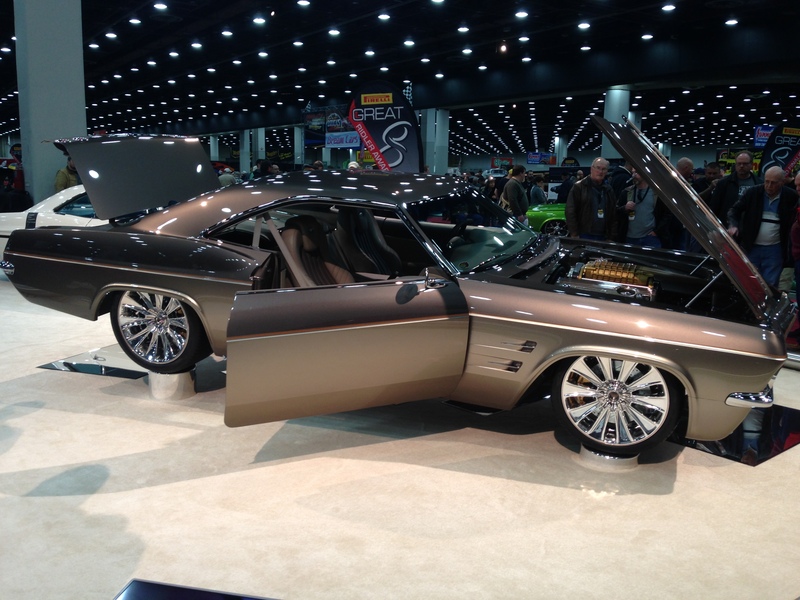 I’ve heard, and read on-line lately, lots of disparaging remarks about his latest creation, the above Impala which took the Ridler award at AutoRama, but I’m not one of those distractors. 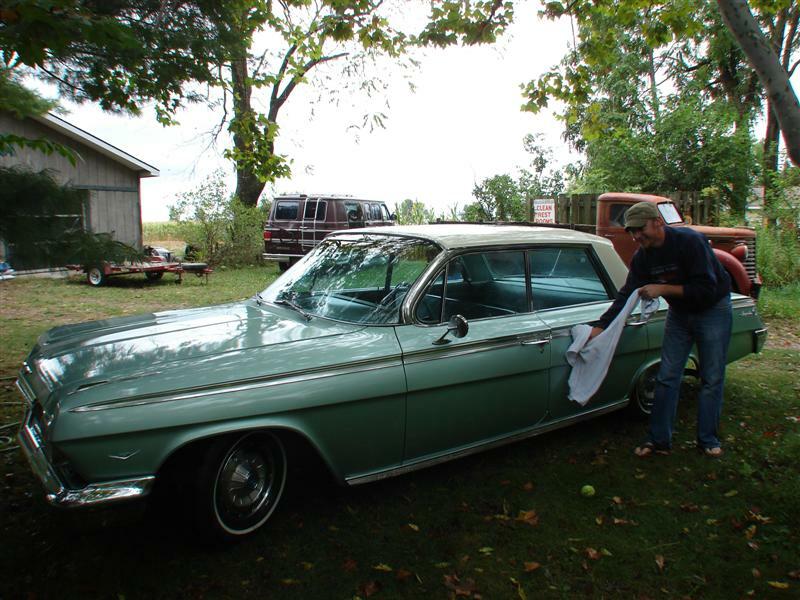 This car is a masterpiece, and was in my head all day yesterday while I was in the shop working on my own two customs, Kim’s ’63 Riviera and my long-term ’59 T’bird project. I don’t have the talent, vision, or admittedly the budget for a car like this, but I take inspiration for my own cars from Chip’s work, and this one spoke to me at a very visceral level. It’s absolutely stunning. The proportions are perfect, the car is radically modified but still looks like a Chevy Impala. Integrated, unified, classic yet modern/ Everything flows, beautifully detailed to a level that boggles my mind. It’s everything that I like about custom cars, and everything I’d like to be able to do. Neptunes Net. We ate raw oysters and watched people surfing across the street. Every so often, things happen which make us take stock of things, what’s important, and what’s memorable. That’s happening to me right now, and it seems appropriate to relate one of the best weekends of my life here. Of course, as with every story, there’s more than just this one moment, so bear with me, and we’ll take a little trip up the California coast, via Michigan. Our son Craig lives in Las Vegas. When he moved out there, he packed up all the stuff he cared about, four guitars, some clothes, a Farberware rotisserie, loaded it all up in his ’68 Mustang GT convert and headed west. The car doesn’t have air, and after a summer of living in a skillet, he thought A/C would be nice. OK, neccessary. 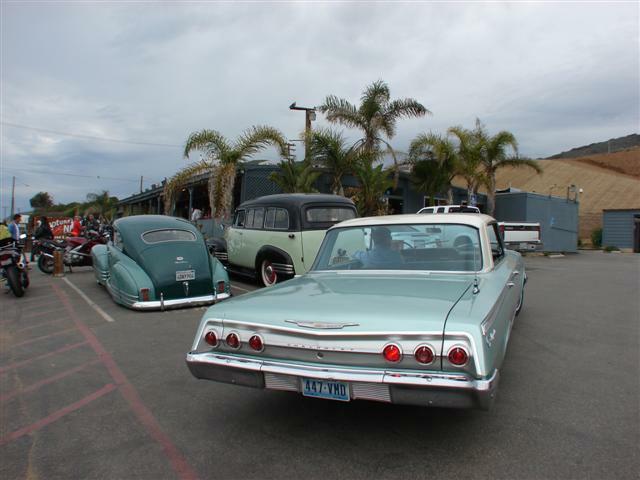 The next spring, I was at my buddy John’s shop, and he had a really cherry looking ’62 Impala Sport Sedan in front. The thing was straight, had a really nice interior, a 283 that ran like a watch, was all freshened up underneath, and sported a probably 40 year old used car lot enamel paint job. John had cut the coils, it sat nice, and, best of all, it had factory A/C. 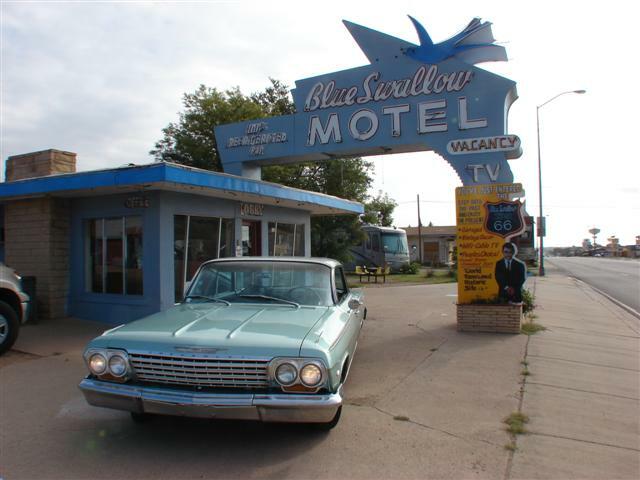 I called Craig, asked if he’d like a ’62 Impala, with A/C, and his response was, “Yeah! What’s a 4 door hardtop?” He’d never seen one! I sent some pics, he loved it, and I bought the thing for exactly what John was asking. Which may have been a little much, but it looked like a winner, and I’m of the opinion that you can pay too little for a used car, but you can’t pay too much for a good one. I liked the “patina’d” look of the car, but Craig said, “It’s ‘Vegas. 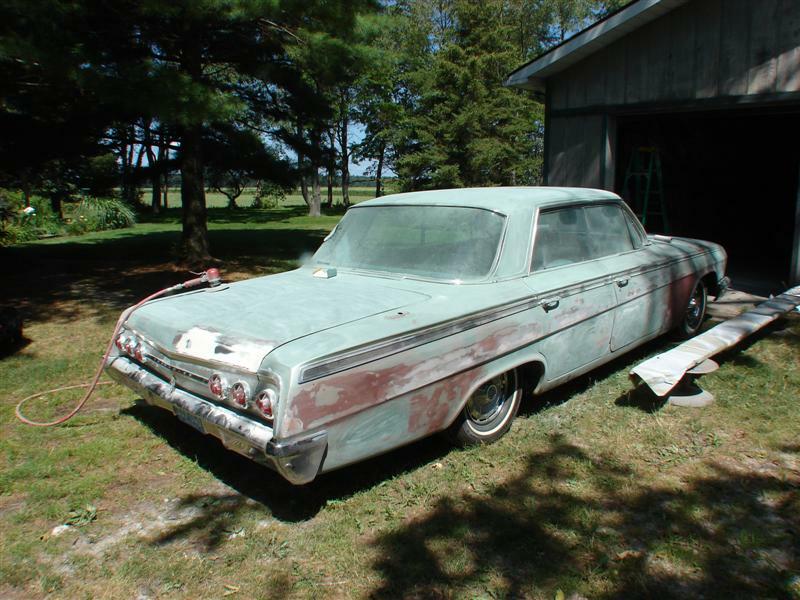 It should be shiney.” I had to agree, and so I spent the next two weeks prepping it for paint. I did find a little rust in the right front fender, fixed a couple of old dings, and was finally ready for paint. I picked a two-tone, Fruehauf cream on the roof, and a light sea-foam green metallic for the bottom, a new Toyota color. It was pretty close to the original. John had told me the heater didn’t work due to a faulty valve, and the A/C turned out to not blow cold. The A/C was easy, a loose fitting and an aluminum line with a hole in it, but the heater turned out to be a major job. I got it all together and ready to go by the first week of September, when Craig was planning coming home. 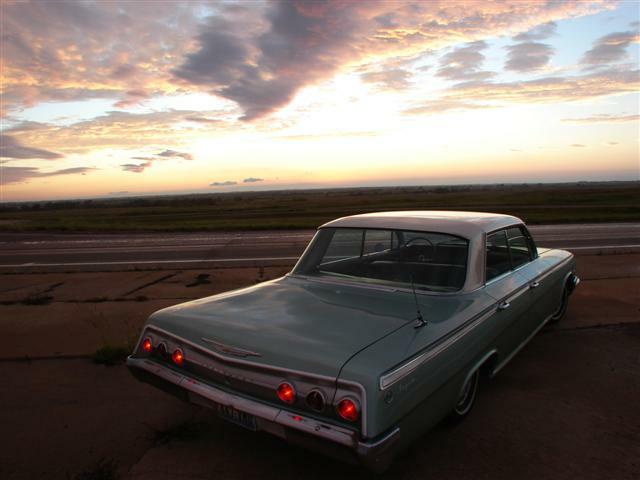 He loved the car, and as I had two weeks of vacation coming, the day he left, I headed for Las Vegas with in the Impala. Pretty trusting, since I’d only driven it into town twice, and to a car show, about 100 miles total. With the A/C blowing cold, all the windows up, a full tank of gas, a Tom Tom and cell phone, I headed west on 1-94. The little old Chevy with who-knows how many miles on it performed flawlessly, and I made to Vegas in 2 1/2 days of driving, not counting a side trip to Santa-Fe to visit my friend Dave, from whom I’d bought the Diamond T. After two days with him, the Impala and I hit the road again, west on 1-40, doing some Rt. 66 tourist type sightseeing along the way. 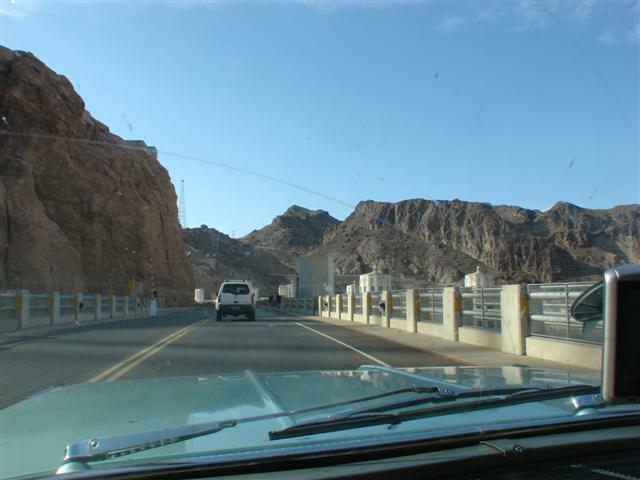 Driving down the grade towards the Hoover Dam in AZ, it was getting hot again, so I rolled up the windows and turned on the A/C. And waited, and waited, and waited for the car to cool off. It didn’t. Evidently, it had leaked somewhere else, and the A/C, which was ice-cold the day before, was no more. The whole reason to buy the car now was on the ozone somewhere between Kalamazoo and Arizona, and it was back into skillet! 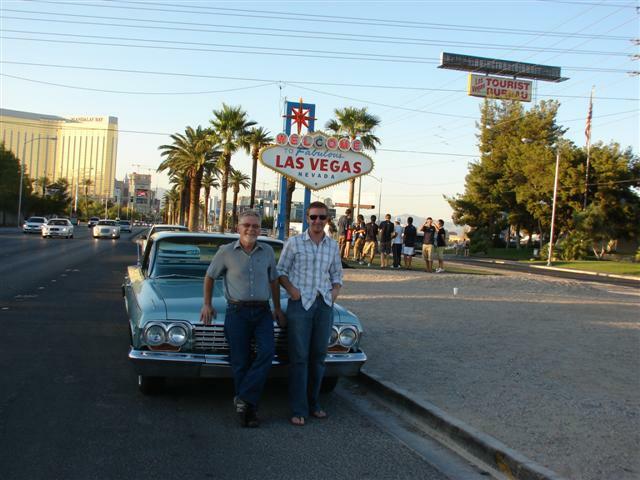 An hour later, I was in Vegas at Craig’s office, and we were cruising the strip. He didn’t seem to mind that the A/C had given up the ghost, and was thrilled to have the car there. Lots more room than the Mustang for golf clubs, friends, and I have to admit the car looked right at home on the strip in Vegas. It fit. Valet parking attendants loved it and always parked the car in a prominent spot to show it off. It turned more heads than a rented Lambo, for sure. I spent several days with him in town, and when it came time to go home, I decided to fly back rather than drive the Mustang. In retrospect, that was a good decision, but we’ll leave that story for the next chapter, along with the road trip up the California coast to Monterey the next spring. See you for the next installment!